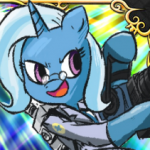 If Rainy doesn't update the servers, I will create my own MLP TF2 VSH servers. If you need the VSP music and sound files I have them all saved on my desktop. Thank you, I would appreciate that very much. Would you like help custom-coding the weapon stats and/or rages? I can help you there! We need someone to help with the servers. Is there any way for the servers to be up soon? The servers were up when the Inferno Jungle update went live, but are still currently down since there was a flow of constant TF2 patch updates and the recent release of the Scream Fortress update, the servers will be back up just no TBA at the moment. Earlier today, I wanted to play on Versus Ponyville, but it says I got banned for being a part of another group. I don't even play on the group a lot. So, why the deuce did I get banned anyway? I got banned for nothing too, or did I? I have a few ideas for a Sunset Shimmer boss. First, use her pony form for regular form, and for her rage, she turns into the demon form as seen near the end of the movie. During this time, she will be impervious to damage for five seconds, and when that is done, she will return to normal pony form, until her rage builds up again. Her model will be a scout with the Sun On a Stick for a weapon. So, that's my idea, and I hope that you will approve of it. I really want to help make a new boss for the game, but I don't know how to do that. Can someone help me? When are you going to update the servers? I can't seem to get in and play any of the games. Hey, I'm looking to organize a team for tournament play. Can someone help me with this? I don't know what it is, but it keeps moving me to *SPEC*. I am getting really upset at the server because soemtimes, when I play, it kicks me out of the game and puts me on *SPEC*. Why is that? I am Sunset Shimmer, named after the villain from the Equestria Girls movie. I also go by other names on Steam, such as The Monkey King, El Dorado, and, Mustang, Spirit of the West.